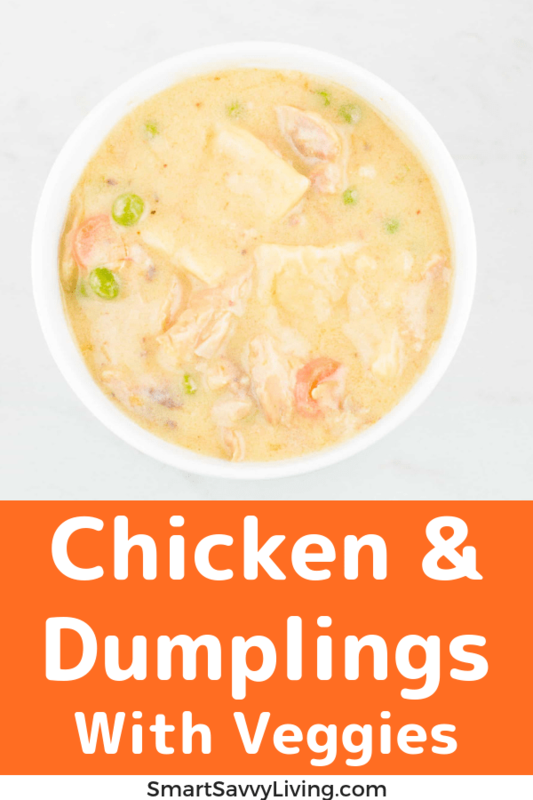 Wondering how to make chicken and dumplings? Check out our chicken and dumplings recipe that’s full of creamy comfort. 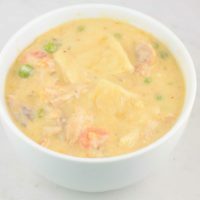 One of the most iconic dishes of the south, especially when cold weather hits, is chicken and dumplings. Most recipes use basic everyday ingredients. But, there’s just something super soothing and comforting about its warm creaminess. If you ask ten people for their favorite chicken and dumplings recipe you’ll probably get ten slightly different recipes. Some prefer a thinner soup-like consistency where others like an almost sauce-like base. Then there’s the debate over rolled/flat or drop dumplings. Some seem to think adding vegetables is committing some sort of sin. I personally like a thicker chicken and dumplings with rolled dumplings. I can take or leave the veggies but in today’s recipe, I’m adding them in. They do add a nice pop of color and extra nutrition. 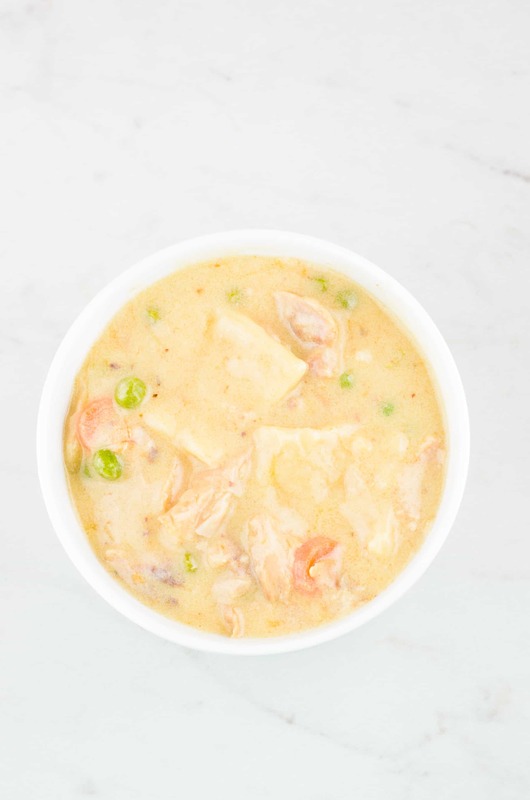 But, I’m not even going to try to say these chicken and dumplings are healthy just because they have veggies included. Honestly, they’re thick and hearty and the perfect meal when you want something comforting without caring about your waistline. First off, you’ll want a good quality dutch oven so your chicken and dumplings won’t easily scorch. I like the Lodge brand as it’s good quality without being super expensive compared to other brands. You’ll also need a large spoon for stirring. I prefer wood because it doesn’t scratch surfaces. I also like a long rolling pin for rolling out the dumplings. Here’s my favorite way to make homemade chicken and dumplings. Set aside 1/2 cup of broth/stock to use later. In a medium-sized bowl mix together 2 cups flour and salt. Make a well in the middle and add the egg. Slowly stream in broth while stirring the ingredients together until a dough forms similar to pie dough. If you don't use the whole 1/2 cup of broth, save it to add to the soup. Let dough rest for about 15 minutes. Turn dough out onto floured counter or parchment paper. Roll out into large, evenly thick rectangle that's about 1/8 - 1/4 inch thick. Add more flour as needed to prevent sticking. Cut into 1-inch squares (I like to use a pizza cutter). Dust with additional flour and leave to dry for 30 minutes to 1 hour. While the dumplings dry, place remaining broth/stock and half and half in a large dutch oven over medium heat, stirring occasionally. Bring up to a boil. Add the carrots and dumplings to the boiling broth mix, cover, and cook for about 10 minutes or until dumplings are tender. Don't shake the excess flour off as this will help thicken the sauce. Once dumplings have cooked, if you want a thicker sauce make a slurry of about 4 tablespoons cornstarch and cold water and add into the boiling broth and dumplings. Once thickened to your liking, lower heat to medium-low and stir in frozen peas, butter, salt and pepper to taste, and chicken. 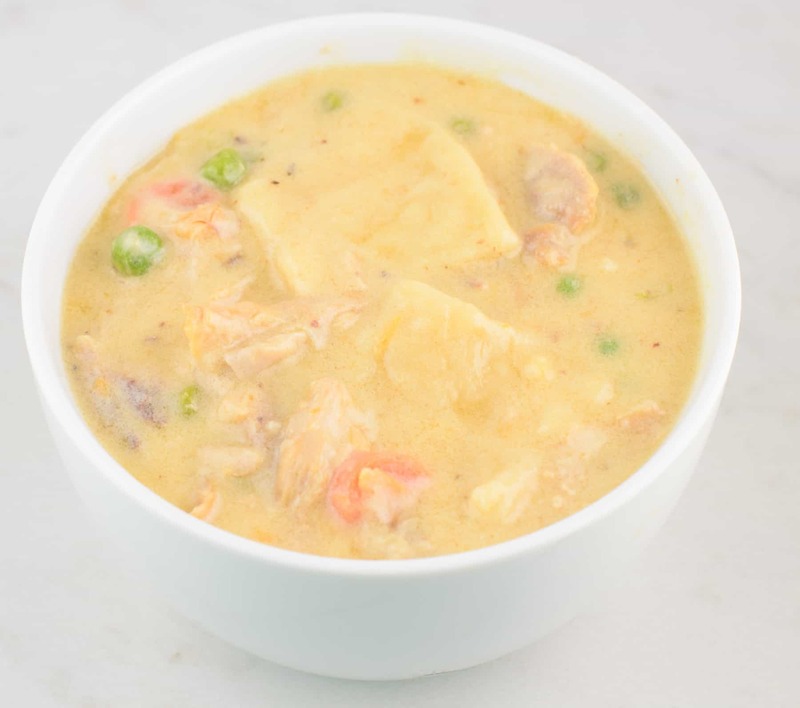 Give the chicken and peas a couple of minutes to warm up and then serve and enjoy! Leftovers can be stored covered in the refrigerator for up to 3 days or frozen. The chicken and dumplings may need a bit of broth or milk to thin out when reheated. While you can use broth from a carton or can, I find the best chicken and dumplings are made with a homemade stock. I often use a rotisserie chicken from Sam's Club that I pick the meat off of (save to use in dumplings) and use the skin and bones for the stock. Just put the bones and skin in a large stockpot with a few unpeeled carrots, celery stalks, and onions cut in half. Also, add a couple of smashed cloves of garlic and bay leaves. Add enough water to fill the pot until about 3 inches from the top. Cover and bring to a boil then lower to a simmer for 2 - 3 hours. Strain the stock from the bones, veggies, and herbs and then cool to skim any fat off and use as directed in the recipe. Any leftover stock freezes very well. Yum! This is one of my favorite childhood meals. I’m definitely going to have to try your recipe on one of mine on keto days.